Boutique Brielle has moved. You can find their new location at 308 Mineral Avenue, in Libby. Soon to be celebrating two years in business, the Boutique and its staff would like to say a big “thank you,” to all it’s clients and customers for their continuing support. With a new location, almost double the size, the Boutique now offers new services for its customers. In recent months, business owners John and LeeAnne Bacus were able to purchase the old, “Shoes and Socks,” building at the above listed address and move from their previous location across the street. The store is family owned and operated, consisting of four generations of women in employment (one member is strictly paid in snacks and candy). Grandmother, daughter, niece, and granddaughter all regularly work onsite together to manage the Boutique. Business is booming, and the Boutique carries four hundred and fifty client accounts as of October 2018. For those looking for some local advice, the Boutique carries a rating of 4.6 on Facebook. You can find new and used consignment products ranging from name brand items to every day generic brands. You will find something for everyone on most days. Or you can open a free account and sell your own items on consignment with the Boutique. If that isn’t enough, the new store location offers a children’s play area in a fully visible location. The goal is to give patrons the ability to shop more freely, while giving children something entertaining or educational to do. Striving to make their customers lives just a little easier, the store has gone a step further and now offers scheduled pickup and deliveries for the Libby and Troy area; for a small fee. For more information on the services they provide, call the Boutique at 291-9020. Grateful to be making it as business owners in Libby, Montana, the Bacus family wanted to give back to the community in some way. Doing so, the Boutique has created an account in the name of Kootenai Pets for Life (KPFL is located at 125 County Shop Road in Libby). Anyone can go into the store and donate under the Kootenai Pets for Life account. The Boutique’s normal consignment fee is waived, giving one hundred percent of the proceeds to KPFL. Keep your eyes open for the store’s official Grand Opening which will be held in the spring of 2019. “It doesn’t have to be new to be awesome,” LeeAnne Bacus told The Montanian. 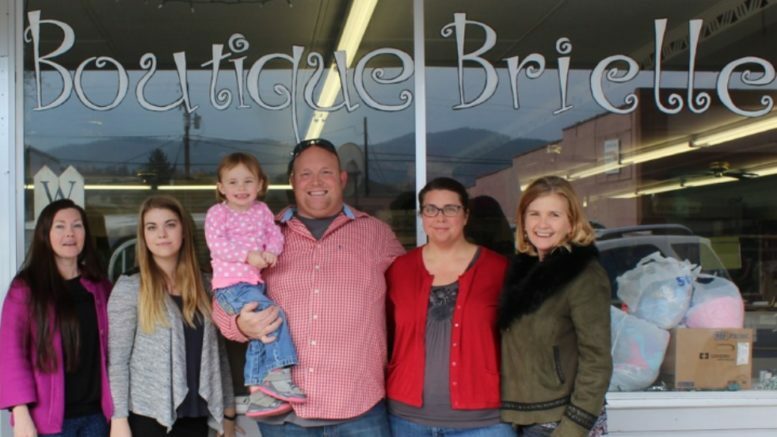 Owners, Richard and LeeAnne Bacus pose with there family members in front of their new storefront. Photo by Danielle Nason, The Montanian.